What a long week this last one has been. It seems like forever ago it was last Sunday. Not an easy week either. We've been pretty mopey around here after putting our dog down. She was quite sick and I could not watch her suffer any longer. Still, it's tough and we've had some rough moments. I keep thinking I need to feed her or hear her outside. Sorry to bum you all out. On that note though, I want to thank you all who have left messages for me here and on Twitter about Maggie. Your comments made me smile. I was amazed at the outpouring. People who never commented before left messages. I guess so many people can relate to having an animal pass. Thank you. In other news, I did a lot of baking this week. Not just from Out of Old Nova Scotia Kitchens but also shortbreads and cabbage rolls. 'Tis the season. I'm gonna need a bigger freezer. Something about Christmas makes me want to bake. "Not that it is a crime to marry, or a crime to wish to be married; but it is an imbecility, which I reject with contempt, for women, who have neither fortune nor beauty, to make marriage the principal object of their wishes and hopes, and the aim of all their actions; not to be able to convince themselves that they are unattractive, and that they had better be quiet, and think of other things than wedlock." Geez Charlotte, that's a little harsh. But good advice. Having a 'nice personality' didn't cut it when looking for a husband. How unfair it was that men held all the cards. Marian Halcombe, the unmarried sister in The Woman in White, knows she is too plain and too clever to marry. Having brains was an impediment to marriage. I guess she was a woman who "think(s) of other things than wedlock." Marian should have started her own detective agency (there's a spin-off series for you). Yet, fictional Marian was offered marriage proposals after The Woman in White came out. Maybe there were men who appreciated a smart woman even in that misogynistic time. And tell me why is George Bailey's wife in It's a Wonderful Life beautiful and happy but when he sees how things would be without him she's a dowdy, sad (gulp!) librarian ("Oh dear God, not a librarian!")? That scene always makes me laugh. Like that was the worst thing Frank Capra could think of. Not dead or anything but unmarried and working at the library. Good grief! Who are your favorite unmarried ladies in literature? The female leads in many of my fave novels are usually more interesting before they get married! Case in point: Isabel Archer from Portrait of a Lady. B.- True. I wonder if Lizzie Bennet did anything interesting after marrying Mr Darcy. I like to think she did though, because she's too smart not to. I love this post! Marian Halcombe is one of my favourite unmarried protagonists, but you have already mentioned her :P There's also Harriet Vane, but she does get married in the end. Who else... I've only just "met" her, but Miss Marple is pretty awesome. And I also liked Rhoda Nunn from George Gissing's The Odd Women. I love the movie beyond all measure but that part has always annoyed me a little too..also because she's a librarian! I feel like I don't know a lot of cool literary spinsters! I know a lot that were 'in danger of' becoming lifelong spinsters, but they usually get married in the end. And I also laugh at that scene in It's a Wonderful Life. I'm so sorry to hear about your dog. We lost one of our dogs earlier this year, and it was a really hard time. I, too, was so touched by everybody's messages to me when that happened, though. I'll be thinking about you. i responded to your comment on my blog but forgot to hit 'email reply' so you missed my condolences on maggie's passing. :( losing a pet is so difficult and i know all about phantom sightings or imagined leash/collar noises. i'm thinking of you! you also mentioned in this post holiday baking. apparently, i signed up for a weekend of baking with my sister--something i don't remember AT ALL--but she insists i said i'd do it. i'm not a huge fan and usually lose interest after the first dozen or so. So sorry about the dog. As someone said to me a few years ago about putting mine down: that is the last loving act of kindness we can do for them. It is so difficult when losing a pet -- they have so much incredible personality and contribute so much to our lives. My heart tugs for you. I do think that baking is sort of a wonderful and therapeutic exercise when dealing with loss, so I was so excited to see your post on the cookbook you were working with. Nymeth- I'll have to read those ones. Amy- Yeah, that's right! She did have a boyfriend before George. Christy- Yes, there are many in danger but are 'saved' at the end. Nat- Thanks. If you're not in the mood for baking, it can be a chore, for sure. Shelley- That's what I say too. Even though it's hard, it needed to be done. Coffee- Baking is great therapy, I agree! sorry I'm late, but I'm so sorry about your dog. I'm so sorry about your loss. Having a very sick pet put to sleep is a kindness to them but it's awfully hard. 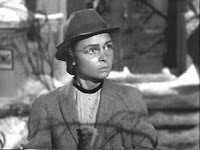 I love "It's a Wonderful Life" but I always thought it was strange that Mary ended up looking dowdy and sad (librarian or not) because I think she would have done just fine without George, really.